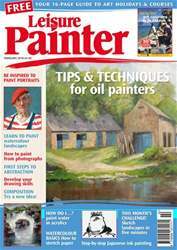 Val Rayner asked in Leisure Painter, November 2017, how to overcome the problems of left-handedness when following the instructions of righthanded tutors. I have come across this in calligraphy and found that using left-handed oblique nibs solved the problem of having the thick and thin strokes reversed as when trying to use a ‘normal’ right-handed nib. When drawing or painting and trying to follow one of Leisure Painter’s excellent demonstrations, I simply stand to the right of the easel or board, and follow the instructions. This exaggerated stance removes the problem of smudging work previously done.